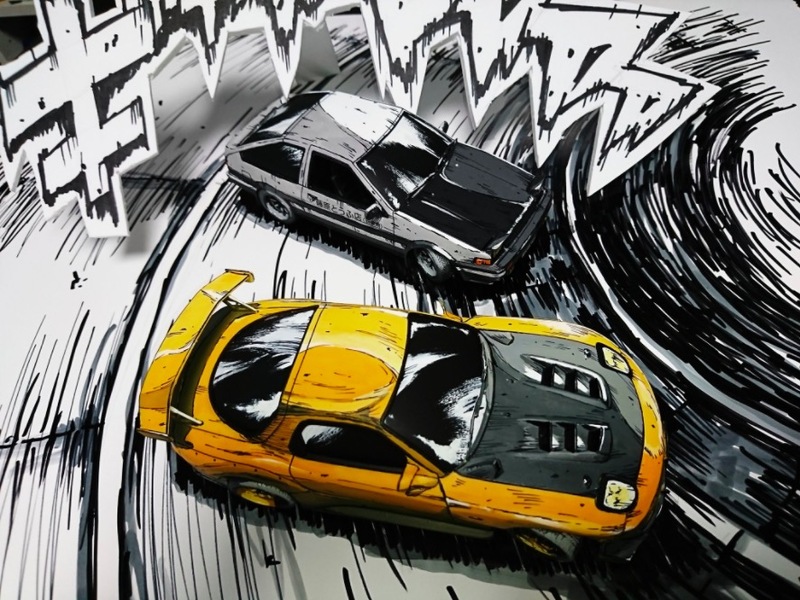 It’s an iconic scene from the pages of Initial D — Takumi Fujiwara’s AE86 touge-battling Keisuke Takahashi’s FD RX-7, drifting through a hairpin. 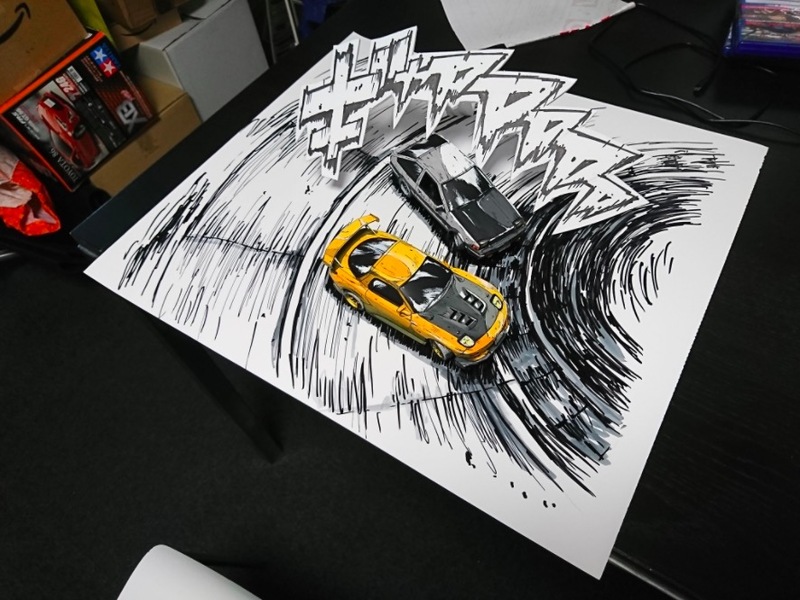 A Japanese artist known as Shinga on Twitter has recreated the moment, but as much as the finished product looks like pen and ink, it’s composed amazingly painted of 1:24-scale model kits. 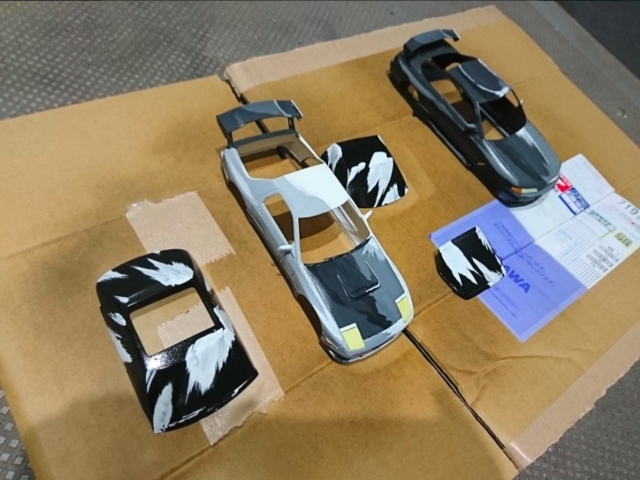 Here’s a look at how Shinga painted the cars, with outlines, motion lines, and shadowing to recreate the art style of Shuichi Shigeno’s original manga. The lighting reflecting off the tops of the cars had to have been planned carefully in advance. According to Kotaku, who discovered Shinga’s work, this style of model painting is common for Gundam kits, but this is a first for cars. Shinga then placed the cars on a large white background with a road drawn on it. Add some katakana “giyaaaaa” tire squealing sounds, and voila. 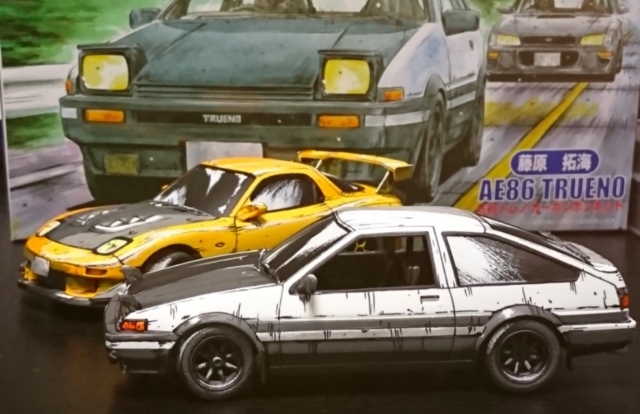 you’ve got 3D cars made to look 2D, from a scene in Initial D. It’s a brilliant take on an otherwise standard model kit. From some more recent posts, it looks like Shinga is working on another scene, using Ryosuke Takahashi’ FC3S and Rin Hojo’s R32 Skyline GT-R. You can see more about how he paints the layers, step-by-step. Check out more images of the AE86 vs RX-7 diorama, as well as the cars by themselves on Shinga’s Twitter. tagged: ae86, corolla, fd3s, Initial D, mazda, rx-7, sprinter trueno, toyota. Wow!!! I’m so amazed at the talent. Hi Diane! How have you been!? Hope all is well! Ah, you are probably right. It’s been a while since I’ve watched it. I’ll make the correction. Thanks! And the Supra commercial version!